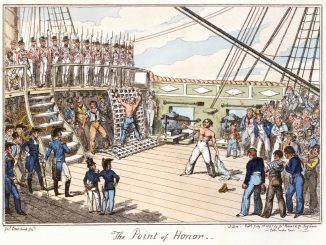 Behold a delightful series of drawings made in 1820 by Captain Frederick Marryat (author of Mr. Midshipman Easy) about his life as a midshipman circa 1806 – 1812. They are definitely not “high art”, but that’s exactly the charming thing about them – they are honest and straightforward, without the pathos and glorification of the paintings at the National Gallery or the Maritime Museum. 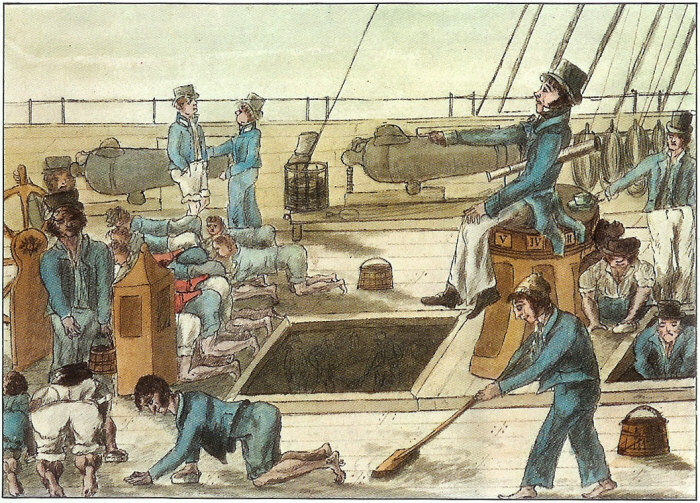 They show how Marryat saw the world as a middie, and while he certainly exaggerated or satirised some bits and pieces, they’re still a rather realistic look on the life of a midshipman in the very early 19th century. Here’s a “self portrait”, showing his mother weeping because his departure is near. 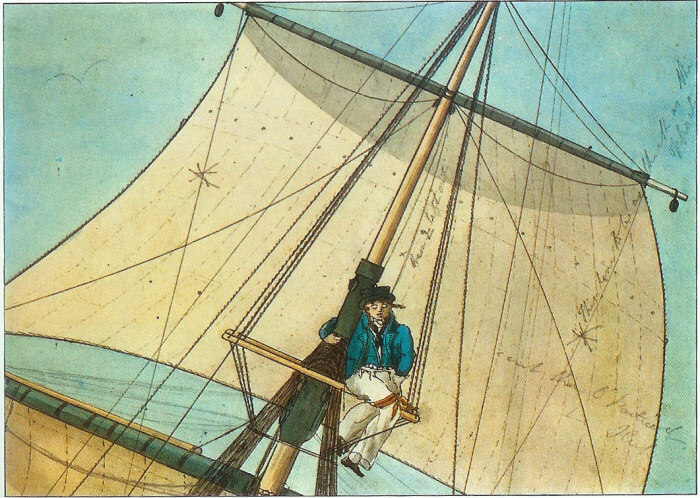 He’s poking his sister in the backside, and the sea chest is being packed with all the things a young gentleman might need at sea (“powdre, green tea, portable soup, holy bible, cherry brandy, meat”.) He’s marked the sea chest with “Mast. Will. C….. – H.M. Ship Hellfire, West India Station”. Please note the painting of Nelson over the mantle. Young Frederick drops his hat in shock as he sees where he’ll spend the next six years of his life. 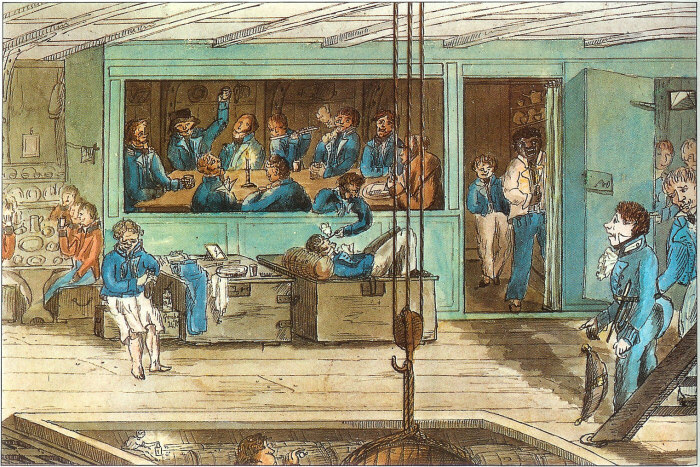 The older midshipmen are smoking, drinking rum or playing the flute, while a young middie is cleaning his boots. Another is napping, and one of his “brother officers” obviously plays a prank on him. 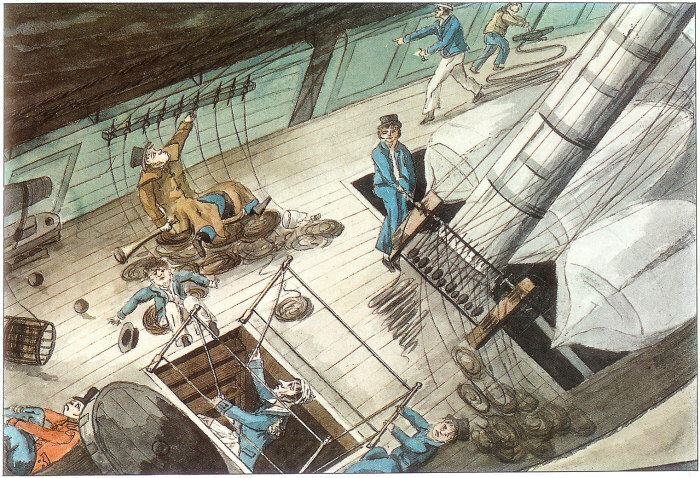 Badly secured cannon balls are rolling dangerously across the deck during rough seas, and the midshipmen try to get a hold wherever possible. It was NOT easy to keep balance under such circumstances, as you can see on the picture! Now look at this poor, dripping wet and freezing middie in the front of the picture! Poor lad – the others had more common sense (or the means) and wrapped up in thick cloaks and coats. A ship’s boy is bringing some rum for the officers on watch to warm up. A midshipman is serving his lieutenant a cup of tea. The lieutenant, spy glass under his arm, supervises the daily holystoning of the deck. 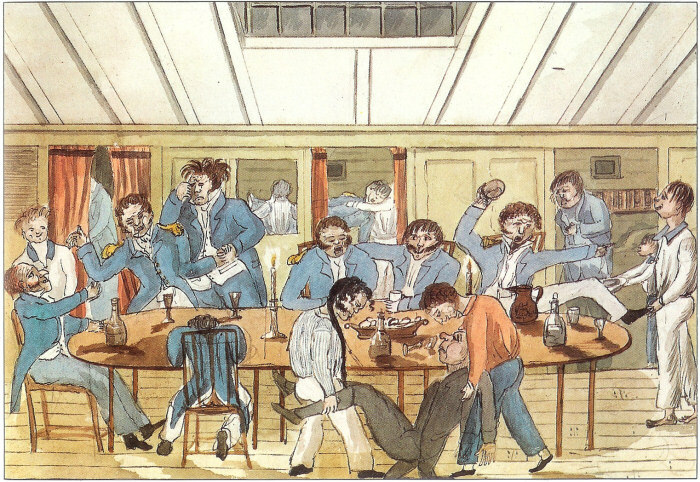 Once a midshipman passed his lieutenant’s exam, he was allowed to partake in the – eh – “festivities” in the officer’s mess. 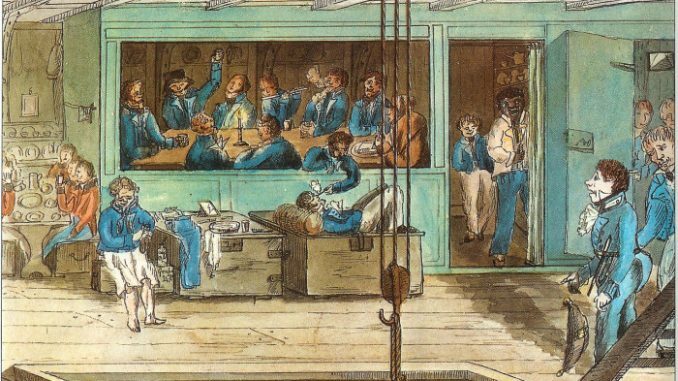 Some of the officers are already completely plastered, one is throwing his cup after the ship’s boy and – well. I don’t want to know what’s going on in the background! 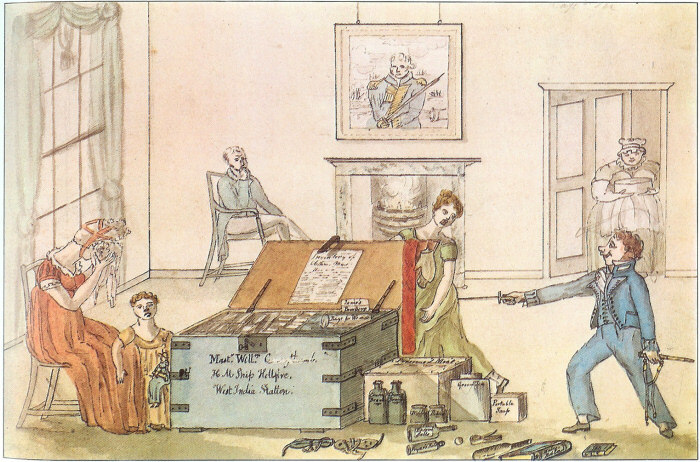 Mr. Midshipman Marryat prepares to leave home. 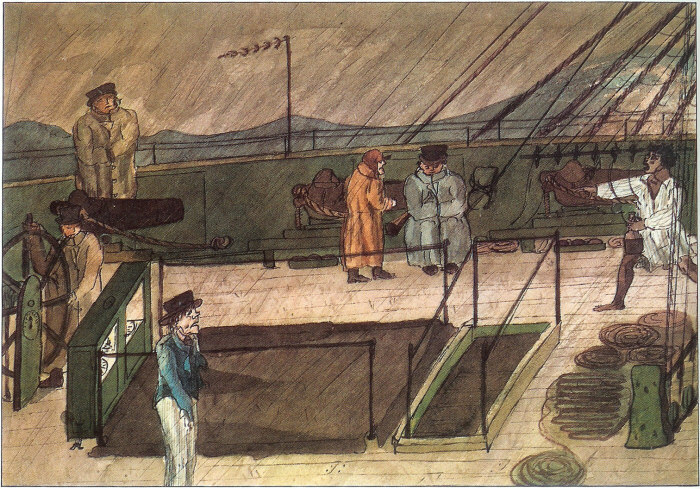 Mr. Midshipman Marryat is masted as punishment. Mr. Midshipman Marryat freezes without a coat. 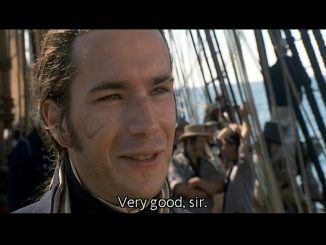 Mr. Midshipman Marryat serves tea. 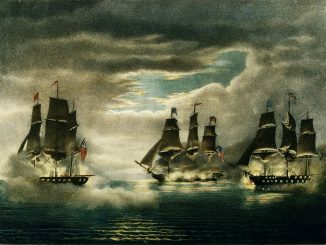 Mr. Midshipman Marryat becomes Lieutenant Marryat and joins the officer's mess. Images and text both courtesy of Joyful Molly.